Almost 26 years ago, Dr. Debra Mesch arrived at IUPUI as an assistant professor in the School of Public and Environmental Affairs (SPEA) and began teaching classes in public administration. In July of this year, Dr. Mesch will step down from her role as the director of the Women’s Philanthropy Institute (WPI) but continue as a professor of philanthropic studies and the Eileen Lamb O’Gara Chair in Women’s Philanthropy. How did she go from teaching public administration courses to holding an endowed chair and the directorship of WPI? How did her journey coincide with the development of WPI and its role as the center of academic research and teaching on gender and philanthropy, and what vision does she have for WPI in the future? It began for Dr. Mesch with a connection to the then-Center on Philanthropy after arriving at SPEA. Fast forward to 2008. Dr. Gene Tempel asked Dr. Mesch if she would step into the role of the director of WPI part-time, while also continuing to hold her professorship at SPEA. As director, Dr. Mesch’s main task was to strengthen the research component of WPI. “It was a new challenge for me, but I was very excited to take on this role,” she said. Ten years later, she’s lived up to that challenge. To build the strong basis for high quality research, Dr. Mesch had to institute several key components. One was a research committee. Then, Dr. Mesch formed the Women’s Philanthropy Institute Council, which consisted of a group of individuals working in the sphere of women’s philanthropy. “Council members come from a wide variety of sectors and professions, which gives us a diverse range of perspectives,” she said. 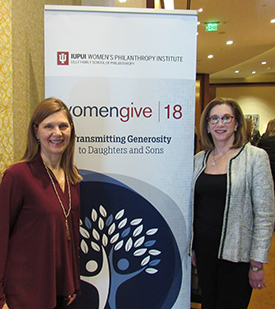 Debra Mesch (right) with Kathleen Loehr, incoming WPI Council chair, in Denver for the launch of Women Give 2018. The Council encouraged Dr. Mesch to have a signature research project that could be applied both academically and practically. That idea led to the Women Give series, which was first published in 2010. Since that initial report, WPI has produced a Women Give study every year. In addition, a transformational grant from the Gates Foundation in 2014 gave Dr. Mesch and WPI the chance to greatly expand research around gender and philanthropy. The result? A bevy of research projects, including the Women Give series, high net worth donors’ support for women and girls, gender and #GivingTuesday, giving circles, and more. With the increase in research projects, Dr. Mesch realized that it was time for a new phase for WPI. “We’re rolling out new research reports almost every month, which is pretty incredible,” she said. “We want to present this research and make sure that nonprofit leaders, donors, fundraisers, and other individuals in the sector can really utilize it. It’s important for us to have this practical focus, so I’ve realized that it’s time for a new director. Dr. Mesch will move into a full-time faculty position and continue to conduct research on gender and philanthropy. The impact she has made as the director of WPI on the field of gender and philanthropy is tangible and powerful. She holds fond memories of her tenure as the director. “I’ve been overwhelmed by the responses I’ve received from audiences I’ve presented to,” Dr. Mesch said. “Seeing the ‘ah-ha moments’ from not just nonprofit leaders, but donors who have witnessed the power of women’s philanthropy in their giving circles, women’s funds, or other giving vehicles, but until that moment did not have the research evidence to support their experiences, is inspiring. The conversations about philanthropy gives them confidence to know that the data supports what they’re doing. Her impact on WPI is noticeable, but Dr. Mesch notes the influence of the then-Center on Philanthropy and now school on her. 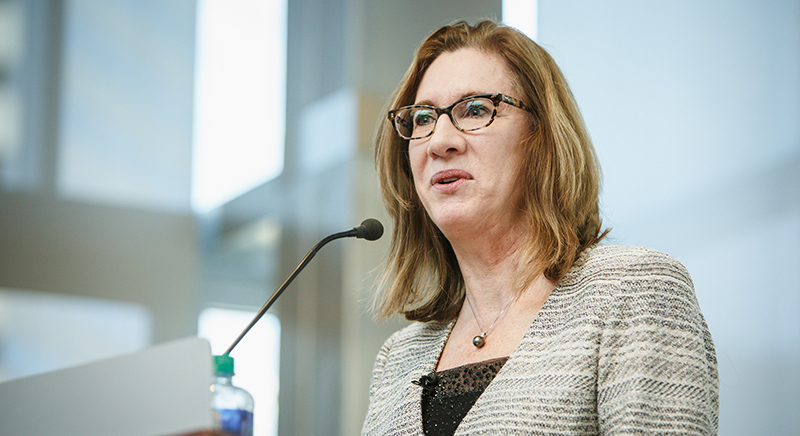 As for her long-term goals, Dr. Mesch hopes that we always consider the role of gender in philanthropy. “It would be a real achievement and a testament to WPI when every research study analyzes what this means for women vs. men, do women and men behave differently, etc.,” she said. information as we formed our program and continue to cultivate women’s gifts.